The ruling Grand National Party bulldozed next year’s state budget bill through the plenary session of the National Assembly on Wednesday despite vehement resistance from opposition parties. GNP lawmakers scuffled with main opposition Democratic Party legislators and their aides to enter the main assembly hall ahead of the plenary session. 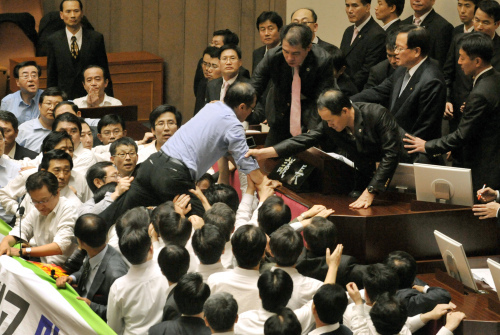 National Assembly Speaker Park Hee-tae exercised his right to restore order, allowing 156 GNP legislators, more than the quorum required for a vote to pass the budget, into the main assembly hall to cast votes. They pulled some 50 DP lawmakers out of the podium in a physical clash and took over the speaker’s seat. National Assembly Vice Speaker Chung Eui-hwa, who was entrusted to preside over the plenary session, declared the opening of the plenary session. The budget bill was shortly presented and a vote took place. Of the 166 assemblymen who voted, including a minor opposition party member, 165 voted for the budget bill. The GNP-dominated parliament also passed the motion to send troops to the United Arab Emirates. Of the 157 who voted, 149 approved of the dispatch, two voted against it and six abstained. The majority GNP unilaterally passed the state budget plan through the parliamentary committee on budget and accounts Wednesday morning in a brief meeting held without the DP attending. The GNP, which holds 171 seats in the 298-member unicameral parliament, has vowed to complete the budget deliberation procedure by Thursday, the last day of the regular National Assembly. The parliament already failed to meet the Dec. 2 legal deadline to pass the budget bill. The government budget of 309.5 trillion won was reduced by nearly 500 billion won to 309 trillion won in the revised plan that passed the National Assembly. The budget was increased to deploy more weapons systems on the islands near the western sea border to deter further North Korean threats and to improve evacuation facilities for residents there. The expenses for the development of the nation’s four main rivers were cut by about 270 billion won from the government proposal. The DP, however, has called for a 6.7 trillion won cut in the river development budget. Also expected to be put to vote on Wednesday were 18 budget-related bills, a motion to extend the mission of anti-piracy forces in waters off Somalia and a bill to allow public companies’ development of areas along the four main rivers. The National Assembly was in chaos Tuesday night as the GNP lawmakers and their aides physically blocked opposition legislators from entering a meeting opened to review budget-related issues. A GNP member was taken to a hospital with minor injuries after being hit in the head by a gavel thrown during the scuffle. About 50 DP lawmakers spent the night at the main assembly hall after taking over the speaker’s chair and podium to stop the GNP from passing the budget bill. They were surrounded inside the hall by some 70 GNP legislators who also came to occupy the hall.